It said that ignorance of the law excuses no one. This is not only applicable here in the Philippines but also in other countries where stricter implementation of the law is enforced like in the United Arab Emirates (UAE) where many Filipinos resides or work as overseas workers. 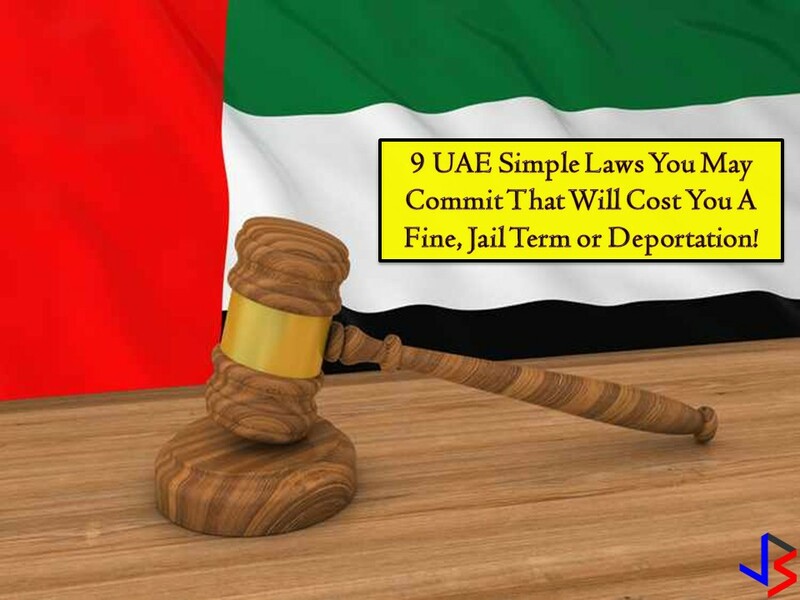 So if you are an OFW in UAE, you should watch out with these nine simple laws that you might accidentally break and make you land into a difficult situation, get fined or prison. In Abu Dhabi alone, Some 50, 595 pedestrians were ticketed for crossing roads illegally last year. The Traffic and Patrol Directorate advised pedestrians to use underpasses, bridges and zebra lines to cross the roads and urge motorist to slow down and give them the right of way. This traffic violation will incur you a fine of Dh400. Taking and publishing pictures of people without their permission is considered illegal in the UAE. It is considered a breach of privacy especially if the affected party files a complaint against you. Fines for cybercrime in the UAE ranges from Dh150,000 to Dh200,000 along with a jail time. There is more. The UAE's Ministry of Interior says that snapping photos or videos of traffic accidents and posting them online is a violation of the law. It is also illegal to post images or videos of aviation accidents. Anyone who found guilty of this may face life imprisonment and/or a fine of Dh50,000 to Dh3 million, as well as deportation. Watch your mouth especially if you are in UAE. Don't you know that you cannot just drop the F-bomb in public? Yes, because this is a criminal offense. Aside from this, it is also against the law to use abusive language in text or chat such as 'middle finger' emoji. Under the UAE’s cybercrime laws, anyone convicted faces a fine of up to Dhs500,000, a prison sentence, and deportation. Article 20 states that slander, using abusive language, or insulting another person or entity using a computer network or any information technology means is a punishable crime. Flashing your middle finger in UAE is offensive and will get you deported. This hand gesture is a violation of dignity and honor under the UAE Penal Code. According to the Federal Penal Law, deportation has been compulsory against those found guilty of flashing their middle finger in public for several years now. Your unkempt and dirty vehicle may cost you Dh500 fines. Authorities have warned the public not to leave their cars unwashed for a long time. It said that this is uncivilized behavior that can tarnish the aesthetic appearance of the city. Aside from this don't you know that washing your car in public parking space or in front of buildings in UAE is illegal? Also, there is a regulation that bans washing a car in residential areas. "This violation affects the environment as the dirty water breeds diseases and fouls the area. It also sullies the aesthetic look of the city and makes the place messy," Car owners who pay illegal car washers on public streets or residential areas will be fined Dh 250 while illegal car washers will be fined Dh500. Anyone who caught littering while walking or throwing out garbage from a vehicle may cost a fine of Dh500. This includes throwing your cigarette buts on the road, in the streets or in the park. In 2017, in Dubai alone, 1,800 people are fined for littering in public places while 500 residents were also fined for spitting on public roads. On the other hand, you may be fined of Dh100 for disposing of waste by burning it in an unauthorized manner. Under UAE Law, the criminal court may convict the person who issues a check that bounced if the receiver files a complaint in the police station. The conviction will be based on evidence provided by the complainant. The criminal court may give the issuer of the cheque a two option either he will pay the money or go to jail. Before you solicit money for a cause or charity, make sure you have a permit to do so. Organizations are required to seek authorization for activities and register the personal details of volunteers. Under the law, it is illegal to conduct volunteering and fundraising activities without authorization. Article 379 of the UAE Penal Code states that punishment by detention for a period of not less than one year and by a fine of not less than Dh20,000, or either of these two penalties, shall apply to anyone who is entrusted with a secret by virtue of his profession, trade, position or art and who discloses it in cases other than those lawfully permitted. Privacy, defamation, and confidentiality are taken very seriously under UAE laws. You are also not allowed to publish information or make false defamatory or accusatory statements that could raise public hatred or contempt against an individual or enterprise. This article is filed under UAE laws, laws and regulations, deportation, fines, prison term, jaywalking violation, expat laws, photography laws in UAE and traffic laws.